The sailboat builder taps a successful and proven Kiwi-designed vessel for its first foray into powerboats. The waters around New Zealand are in the crosshairs of the hellacious Roaring Forties, so its native craft have to be tough. And many are, including the model that became Hylas’ M44—the Corsair 44. 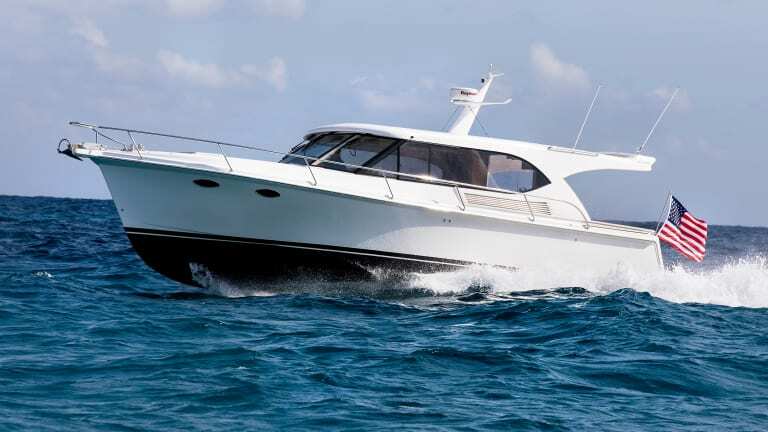 Conceived by designer Dean Salthouse, the Corsair 44 has been successful in the island nation as a cruiser, patrol boat and offshore fishing vessel. But Salthouse wanted to expand his reach and knew of Hylas’ 30-year-plus run building bluewater sailboats, so he approached them with a notion to collaborate. It was kismet. 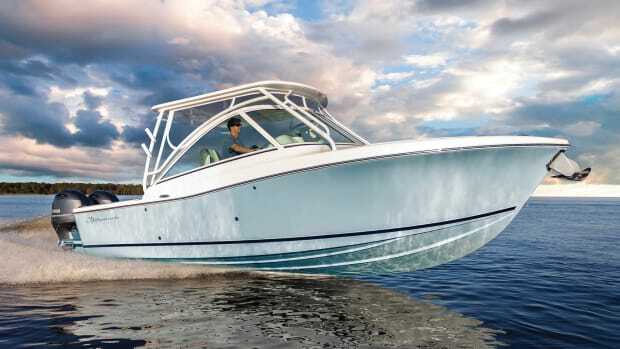 “We wanted to get into the powerboat market and happened on [Salthouse’s] classic, Down East workboat, a good package for the U.S.” says Hylas -National Sales Manager Kevin Wensley. Production was moved to Hylas’ Queen Long Marine shipyard in Taiwan, with an eye on fine-tuning her for the American market. I could see that Down East influence—large windows in her pilothouse and a roomy cockpit—as I approached the M44 moored in Newport Harbor. However, I immediately came to admire how she differed from those craft. Most notably, it’s her long, straight hardtop roofline echoing the sheer that accentuates a sporty, unfussy look. 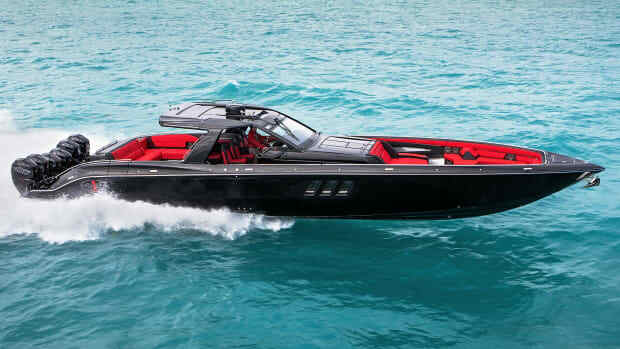 That hardtop shades the entire cockpit and is wide enough to hold a few kayaks, stand up paddle boards or an inflatable dinghy; there are pad eyes to dog down your water toys. 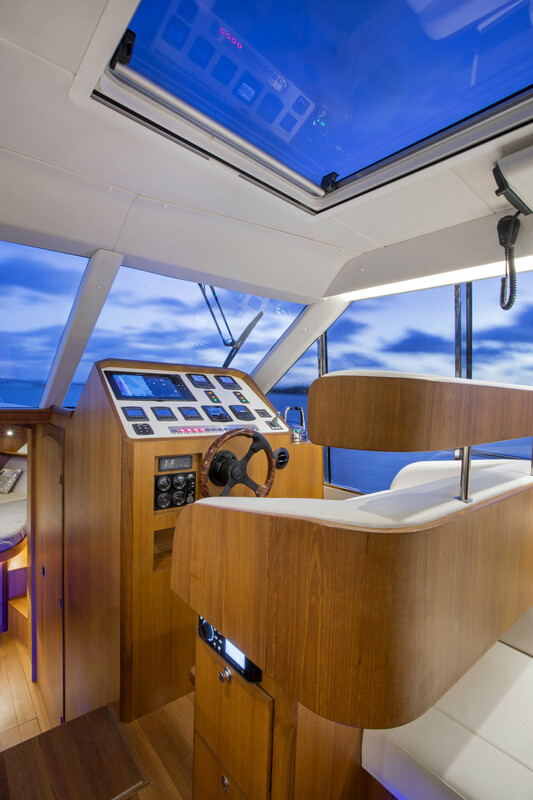 The salon was blazing hot from sitting in the late summer sun but quickly cooled after we opened up two large, manual sliding hatches in her hardtop, sliders to port and starboard and the aft window and pocket door. 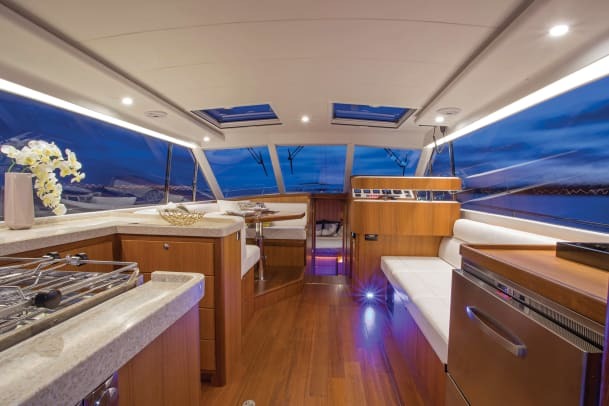 At nearly 4 feet wide, the aft manual window is simple and effective: It opens effortlessly with a gas ram, secures to the hardtop and is ideally matched to the galley aft to serve guests both in the cockpit or at the four-person dinette forward of the galley’s C-shaped countertop. Hull No. 1 is graced with a gorgeous teak interior and its honeyed, flawless finish glowed. 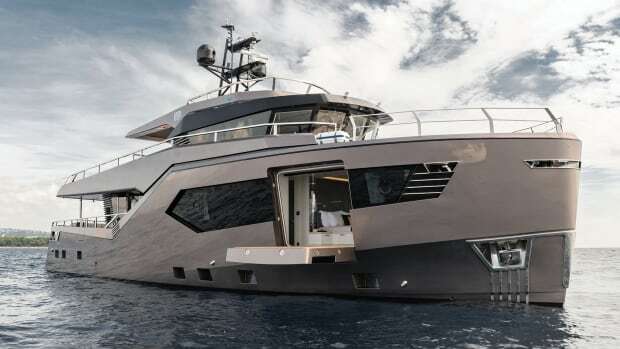 Credit Hylas’ decades of experience in a boatyard “bursting with multi-generational yacht building talent,” said Wensley. 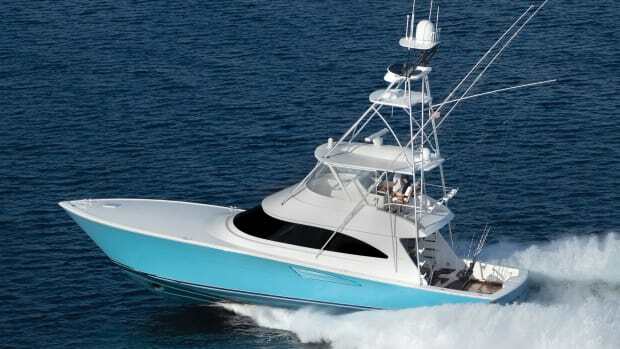 One thing that wasn’t updated was the 44-footer’s proven hull. 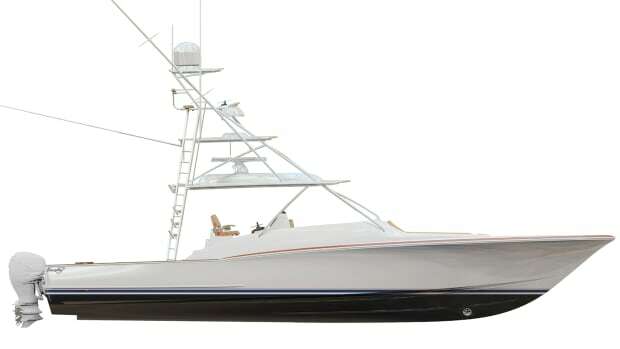 Salthouse attributes the boat’s success to two chief attributes: a fine entry with flared bow and the 3-foot, 2-inch skeg keel. “The flare is an integral part of [its] seakeeping ability as it morphs into the fine bow section, enabling a smooth and comfortable ride in moderate sea conditions,” he says. The keel protects running gear and helps it track well in a following sea. I found the M44 to be agile as I squeezed through moored vessels in Newport’s bustling harbor. 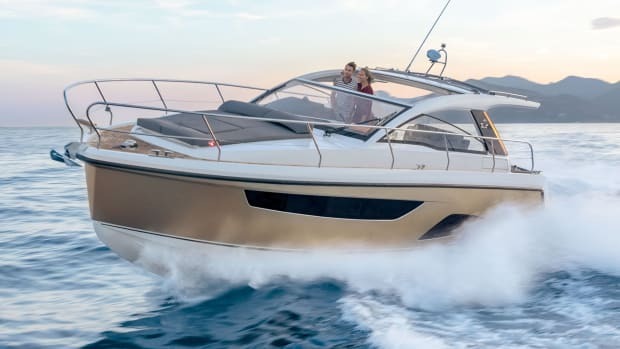 Sightlines are unobstructed in all directions; I could easily peek out the large slider at the helm to see my aft quarter and if needed, there’s a built-in step there for easy access to the foredeck. The 2-footers in Narraganset Bay didn’t provide much of a fight, so I aimed towards some larger craft’s wake and firewalled the throttles. 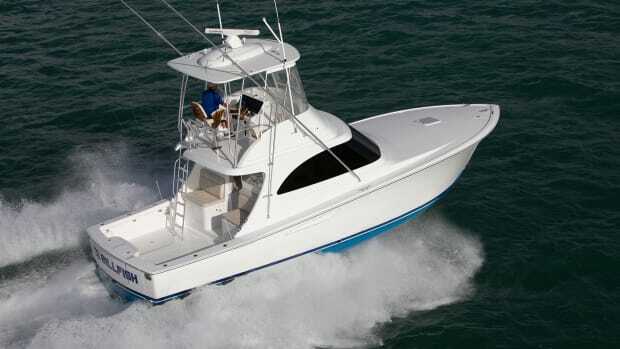 Twin 370-hp Yanmar diesels propelled her to a 30.5 knot top speed and she made mincemeat of the 4-foot wakes. At her optimum cruise at 2900 rpm and 22.5 knots, she burned a miserly 23 gph. 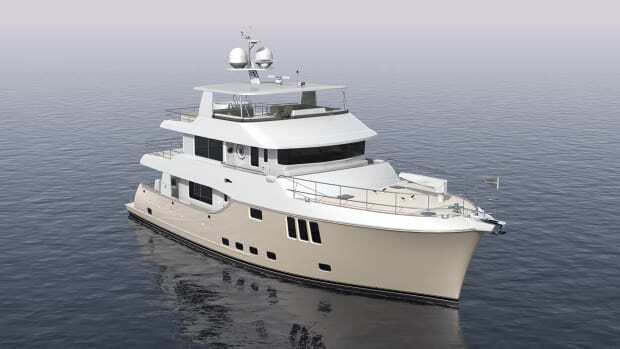 The two-stateroom, single head vessel base price is $695,000, with options for a bow thruster, Seakeeper and owner’s choice of electronics package. 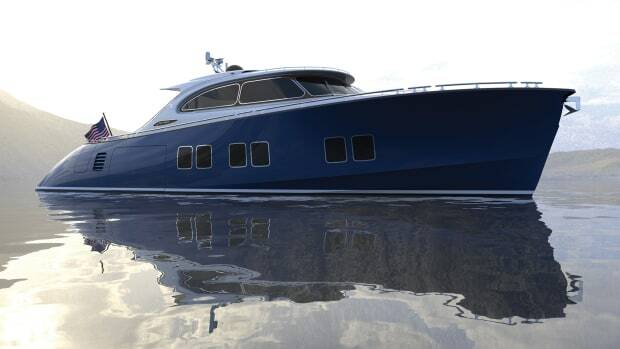 Looking for a stylish, fun to pilot, fuel-efficient vessel that can sleep six? The Hylas checks all the boxes.